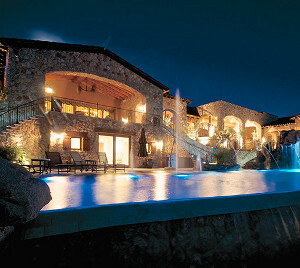 Tidbits about your lifestyle, family and home can net a well-designed A/V and automation system. “It’s like peeling back an onion,” says custom electronics (CE) professional Tommy Kissell of Texas-based Eco High Fidelity, of his first meetings with prospective clients. “The more we know about a client, the better equipped we’ll be to design a system that suits their habits, routines, schedules and lifestyle.” So what are some of the areas you can expect your CE pro to ask you about? Certainly, he’ll need to know whether you plan to automate an existing house, will be remodeling or would like to put the system into a house that’s on the drawing boards. Some of your first meetings with a CE pro could take place at your house; this will give the installer an opportunity to gauge the complexity of the job. He’ll need to see if there’s an attic, basement or crawlspace through which to fish cabling; if not, he may investigate other wiring avenues. He’ll be able to see first-hand if there are any materials like concrete and stucco that could make the project more difficult. Also, he’ll probably ask you about current technologies your home might already have: built-in speakers, a computer network, a security system? With a clear understanding of your home’s makeup, a CE pro will be able to determine the types of tools and manpower he will need to get the job done, and what types of products and systems—for example, wireless or hardwired—will work best. Everybody can rattle off a few items they find annoying or inconvenient about their home. Maybe it’s the closet and bathroom lights that nobody bothers to turn off, or the tedium of locking up and shutting things off before bedtime. A CE pro wants to hear your pet peeves you so he can design your system that takes care of those trouble spots. Don’t hold back, and make sure every member of the family has a say. How do you use technology in your home now? For example, are you a fan of streaming music and video services? Are you a PC or Mac user? Do your kids do much of their homework online? What about mobile devices? Are they loaded with apps? A CE pro can tell a lot by your current use of and familiarity with technology. For example, if everyone in family is an avid user of an iPad, your CE pro may design a system that lets you use this device to manage and monitor your home systems. If you have thousands of CDs, then those might be prioritized within a whole-house audio system over streaming services, for example (or perhaps you’d rather pare down the collection and simplify to the streaming route). Lifestyle is a big buzzword in the home technology industry, and for good reason. A candid discussion of your way of life will likely reveal the most important pieces of information a CE pro needs to design and implement a system so in sync with you and your family that you’ll wonder how you ever managed without it. At the very least, expect to divulge your household status (single, married, kids, elderly parents), your family’s schedule (work, school, travel), your social life (do you entertain frequently) and your hobbies (sports, exercise, photography, art collecting, etc.). If your daily routine involves a half hour on the treadmill, perhaps you’d like to have some music piped in over in-ceiling speakers rather than be tethered to an iPod; or maybe create the proper lighting environment for displaying artwork. Do you want to show off your home electronics investment or keep it under wraps? Your aesthetic preferences will help a CE pro decide whether he should install speakers that recess into the walls or models that stand out in the open, for example. If you like the idea of having all of the A/V components (amplifiers, processors, Blu-ray players, etc.) hidden completely from view, by all means tell your CE pro. There are lots of clever ways to hide technology. Prepare to have an idea of when you’d like the project started and finished. Do you want everything installed by the holidays? Is there a special event by which you’d like the project buttoned up? Based on answers to earlier questions, a CE pro is probably visualizing a system, but when you say you want it done in six weeks, he may have to rethink the plan, or may even bow out if you’re firm on the deadline. Be clear with your timeframe; be flexible if you can. Committing solely to wireless technology is ‘a recipe for failure’ for integrators. Here are the four home network infrastructure options to consider for every project. Commitment certainly has its place in this world, like in relation to spouses or sports teams. But over-committing to a singular technology? That can be a risky move. While Wi-Fi is the technology buzzword, particularly with homeowners, those of us tasked with actually fitting the myriad of modern electronics and digital services into a high-functioning, seamlessly networked home must understand the whole landscape. What makes the current 802.11 Wi-Fi standards so alluring is the convenience of its mobility, ubiquity, and interoperability between so many devices. While the appeal is that Wi-Fi is seemingly in everything—our computers and smartphones, our televisions and cameras—that is also part of the problem. The 2.4GHz spectrum is being shared by all of your Wi-Fi devices, all of your neighbors’ Wi-Fi devices, and even proprietary devices such as baby monitors. That’s quite a load. When the physical limitations of RF bands are strained or exceeded, it reduces the quality of service for every device, and consequently every person relying on them. Those limitations are the source of audio drop offs, buffering delays or reduced definition during a streaming movie, and latency in competitive multiplayer video games. These nuisances undermine the intent of quick, reliable access to content, which is the very point of incorporating many technologies into the home. Your customers deserve better than that. Part of the solution can be to use the 5GHz band for 802.11n or the upcoming 802.11ac standard to help alleviate some bandwidth traffic, but these options are not without their own limitations. First, the 5GHz band has less range than 2.4GHz and struggles to pass through walls and other building obstacles. Second, many devices today only communicate on 2.4GHz. While additional devices are expected to be dual band, 2.4GHz will continue to be the most used band in the near future. So, truthfully, the real solution is recognizing wireless is not the be all, end all. And that’s okay. What a network needs to be about is uninterrupted access and content, and it falls on the installer’s shoulders to ensure the best user-experience. Networking a home with a strong wired backbone remains the best practice to achieve top performance. Should an existing home have only a limited wired Ethernet network, a coax network using the MoCA standard, or a powerline network using the HomePlug AV standard, may be able to bridge the Ethernet service to the desired destination. Both of these wired technologies are affordable and easy-to-install networking alternatives that can relieve the Wi-Fi network of its highest bandwidth responsibilities. This will ensure superior performance for streaming and surfing on mobile and smart devices. At the end of the day, all customers really care about is streaming that movie on Netflix with a pristine picture, synced audio, and no interruptions. Committing solely to a specific technology is a recipe for failure. Employing multiple technologies to build a complete, robust networking solution that can handle multiple applications is often the best solution. When it comes to home networking, some technologies get more press than others these days (like, wireless). However, there are many viable options out there, each suited to address particular needs and overcome specific obstacles. Understanding all of the technologies available allows you to make the educated call on how best to accomplish each stage of designing a strong network for the technology-filled home. The Not-Extinct Ethernet Option: This option remains tried and true. Despite the introduction of newer alternatives with impressive stats and advantages, the truth is that nothing is faster, more reliable, or more secure than wired Ethernet systems. The solution already offers throughput capabilities of up to a Gigabit per second in a 1000BaseT network and 10Gbps for a commercial oriented 10GBaseT network using Cat 6a. And innovation hasn’t stopped finding new uses of Ethernet, either. HDBaseT has made it viable to use Ethernet cables for transmitting HDMI signals over long distances, enabling streaming of high definition video and audio around to multiple areas from a central location. Though retrofitting Ethernet installations into existing homes can be costly and labor intensive, it is the best option for steady, high-quality performance. The Up-and-Coming Coax Option: For existing homes with a limited Ethernet network, coax networking is emerging as a feasible alternative technology. Commonly referred to as MoCA (Multimedia over Coax Alliance) in deference to the technology’s leading standards body, this technology is already built into most cable boxes for multi-room DVR functionality. MoCA works reliably by transmitting over a frequency band unused by cable TV transmissions. MoCA can also be used to stream video and audio to areas of the home that were previously without streaming service. The most frequently used MoCA standard today, 1.1, has a throughput of 170Mbps. The speed and reliability of this offering, paired with its ease to employ and cost-effectiveness, make it an attractive choice. The Not-To-Be-Overlooked Powerline Option: The powerline option uses the readily available electrical lines to extend a home network’s reach. Though early powerline technologies encountered many issues, making some installers wary of the technology, the more recent standards from the HomePlug Powerline Alliance deserve due consideration due to better performance and greater stability. The HomePlug AV2 specification, introduced in 2012, delivers a maximum throughput of 500Mbps. It’s also the simplest of networking equipment options to configure. Merely plugging in two powerline networking modules gets a quick auto-confirmation of the connection within seconds. The modules then act as transmitters or receivers for data signals over the electrical line, and with most hardware, provide extra Ethernet ports for incredible flexibility. Like all technologies, this one also has limits and obstacles. One obstacle is surge protectors, which can block network transmissions. Powerline also suffers from greater signal loss and more noise than Ethernet cable or coax, making it the third best option for high-bandwidth applications. However, for a simple and convenient solution, powerline technology may be the best fit for a fast extension of the wired network. The Ubiquitous Wireless Option: Wireless is the new “it” thing. It’s the enabler for all mobile applications and often thought to be the networking option that makes your customer the true master of his or her space . It’s an undeniably flexible solution, which can offer speed and convenience to both you and your customers. Since its formation in 1999, the Wi-Fi Alliance has governed the evolution of the most commonly used standards. The most recent standard, 802.11n, was released in 2009 and boasts an impressive maximum speed of 300Mbps with the capability to broadcast over two frequency bands, 2.4GHz and 5GHz. The convenience of Wi-Fi is why it’s so frequently turned to for streaming our entertainment. But it also has limitations: Scarce bandwidth, range limitations and vulnerability to interference all need to be considered in the network design, and many of these limitations or shortcomings can be avoided by offloading high-bandwidth applications to wired networks where possible. The key to constructing the most robust home network is assessing the best solution for the right application. There is no single solution that meets the performance expectations and budget of every application. Installers must understand the strengths and limitations of each solution so they can best service the needs of their customers. Over the years, Sonos, once a fledgling startup, has grown up to dominate the DIY multiroom wireless audio space. Now it has some serious competition. Bose has officially unveiled a new line of Wi-Fi speakers under its new SoundTouch brand, which features simple setup and operation, and it’s definitely aimed at the same audience that Sonos has targeted. The three new speakers that are available at launch — you can order them today — are the SoundTouch 30 ($699), a larger speaker designed for larger living spaces, and the SoundTouch 20 ($399) and SoundTouch Portable ($399), which are designed for somewhat smaller rooms. Bose will also introduce a Wave SoundTouch music system ($599) in December and other SoundTouch speakers and audio products in early 2014, signaling that it’s going all in on wireless audio. It shares many of the same traits as the Sonos system, but one of the differences is that it’s designed to work with your existing Wi-Fi network and doesn’t require a special “bridge” like Sonos does. However, that Sonos Bridge, which connects to the Ethernet port on your router, sets up a separate “mesh” wireless network that’s dedicated to streaming your audio and helps remove the hiccups typically associated with a Wi-Fi network, which aren’t incredibly reliable. But Bose is pushing the simplicity of its system and how easy it is to set up “using your existing home Wi-Fi network” and nothing else. The other simplicity theme revolves around Bose’s use of “presets”; both the new speakers and new apps – Android and iOS devices are supported at launch along with Macs and Windows PCs — are equipped with buttons numbered 1-6. Each number corresponds to a preset in the app. Using the apps, you can drag and drop specific Pandora radio stations onto a number to set it as a preset. You can also link one of the presets to the music library on your PC or a specific playlist. To get your music up and running, you simply press one of the preset buttons that’s on the speaker or the included remote, or within one of the apps. Thus, the SoundTouch name. Like Sonos, the speakers and apps will get software updates that add new features and services. At launch, I was underwhelmed with Bose’s line up of services. Beyond Pandora there’s nothing: no Spotifiy, no Rdio, no Deezer, no nothing. Sonos has a huge roster of service tie-ins, so Bose has a big hole to fill there. 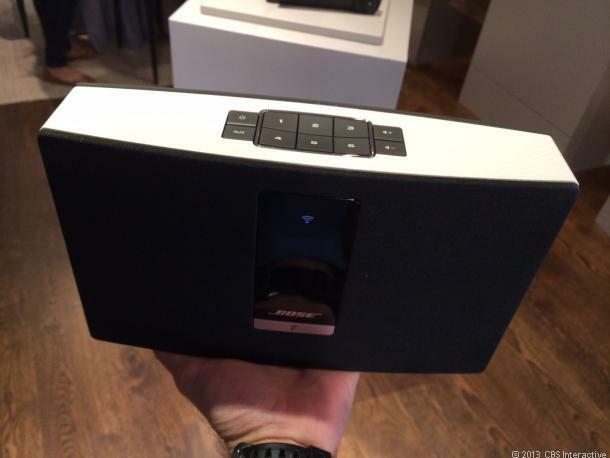 The other thing you can’t do with the Bose SoundTouch speakers is combine two speakers to get stereo sound. That starts to get a little expensive when you’re combining $399 speakers to make a pair, but these types of speakers that have their drivers very close together typically feature little to no stereo separation, so it’s a nice option to be able to go stereo like you can with Sonos. The SoundTouch 30 and SoundTouch 20 both offer Ethernet connectivity, so you can use a wired network connection if you want, and there’s an auxiliary input, so you can hook up an audio device to a speaker using a cable. The Bose speakers aren’t equipped with Bluetooth (neither are the Sonos speakers), but they do support AirPlay streaming from iOS devices and PCs running iTunes. And like Sonos, you can stream music to a single room or have the same music play on all your speakers at the same time. You should be able to play different music sources in different rooms, but I didn’t test that feature yet. Bose did a sound demo in a controlled environment with hand-picked music tracks, and like most of Bose’s demos, the speakers came across in their best light and seemed to sound quite decent for their size. I suspect the SoundTouch 20 will match up just fine against the Sonos Play:5, which is about the same size and also retails for $399. Currently, Bose isn’t offering any SoundTouch speakers for less than $399, but you’d think that may change in the future with Sonos offering more-affordable speakers. However, the next batch of SoundTouch products will be more expensive except for the SoundTouch Controller, a swankier remote that will come out early in 2014 for $99. I’ll let you know how the launch speaker systems sound — and how smoothly they operate — as soon as we get our hands on some review samples. Naturally, it will be interesting to see how the market responds to having a second major competitor in the DYI multiroom wireless audio space. But one thing is clear from Bose’s announcement: it’s going all in on wireless audio; it’s not messing around and will surely put big bucks toward marketing the new SoundTouch line and telling everybody how easy it is to use.